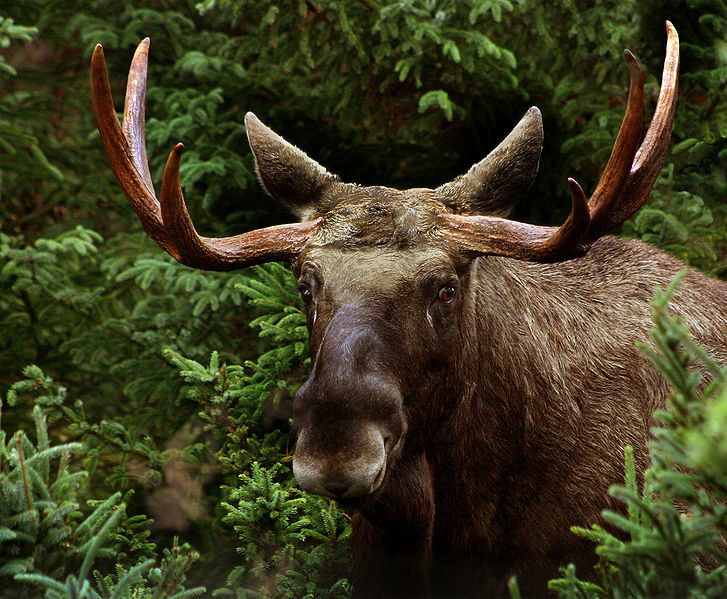 Alces alces, also known as the moose, is one of the most interesting organisms in the world. Standing at approximately six feet tall at the shoulder, weighing up to 1,800 pounds, and being about ten feet long, moose are the largest member of the deer family. The common name of Alces alces is moose. "Moose" comes from the Algonquian word “mus” or “moos”, which means “twig-eater” or eater of twigs. In Latin, alces means "elk". This can sometimes cause confusion when talking about Alces alces because European countries refer to it as "elk" and North Americans refer to it as "moose". This situation is the exact reason scientific names are used. No matter where you are in the world or what language you speak, Alces alces will refer to this organism! Alces alces has many characteristics that make it quite unique and easy to identify. First off, you can identify them by their huge antlers. The antlers can get up to as wide as five feet! However, only the male moose, also known as bulls, grow antlers. 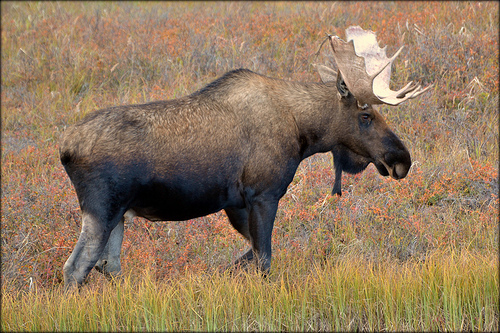 Another characteristic of the moose is their dark brown fur coat, however only mature moose have dark brown coats. Young moose, called calves, have light brown fur. It darkens as they mature. The fur is actually hollow and allows for many features, such as keeping them warm during the winter and for buoyancy when in water. One of the oddest characteristics of Alces alces is the presence of the dewlap, also called the bell. 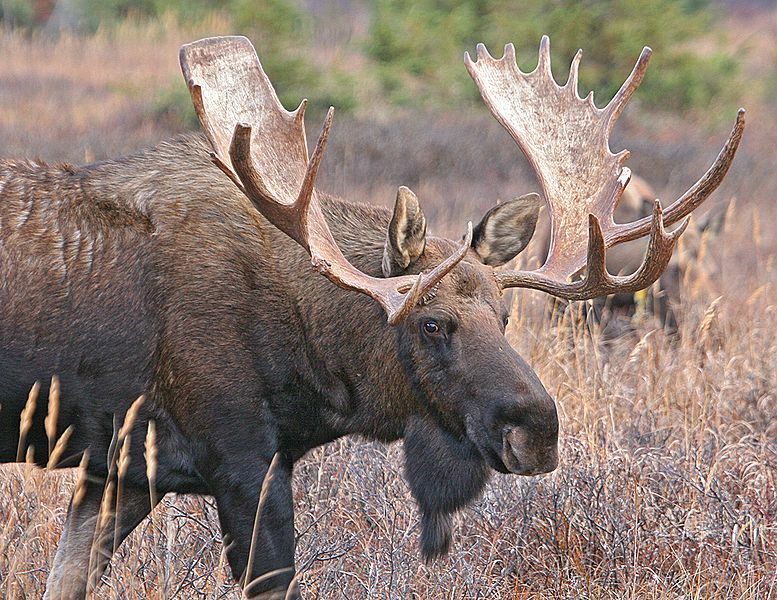 The dewlap is the flap of skin that hangs under a moose's chin. The function of the dewlap is unknown, but there are theories for it. One theory is that the dewlap is used for communication during the rut, both by sight and smell. During the rut a bull will rub the cow with his chin, also called chinning, and the dewlap transfers this bull's scent to the female. Another theory is that the size and shape of the dewlap may be an indicator of dominance to other bulls, just like the size of the antlers are. Go to Classification to see where the moose fits into the grand scheme of things! Also, check out MultipleOrganisms.net to check out other fascinating organisms! Go to Mooseworld.com for even more information on Alces alces! Go to National Geographic for more information also!